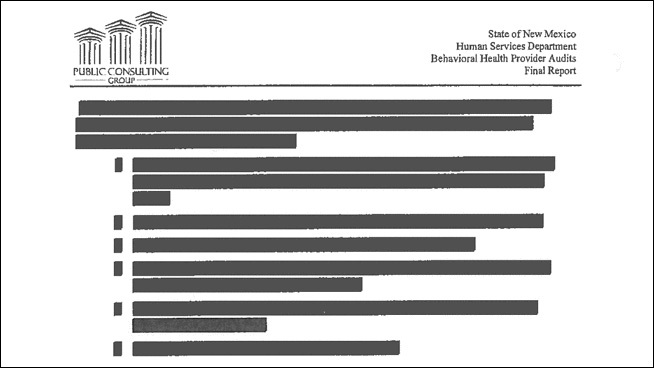 A screen shot of a newly released page from the behavioral health audit. On this page, everything - even the bullet points before the text - is redacted. A portion of an audit released Friday by the New Mexico Attorney General’s Office with many details blacked out shed little light on why the state froze Medicaid payments to 15 New Mexico behavioral health providers. At the same time, the 58-page document raised tantalizing questions. Read the heavily redacted, 58-page document here. Hundreds of pages that detail the specific findings against each of the 15 audited health providers. The Attorney General’s Office (AGO) released the document to the New Mexico Foundation for Open Government, which posted the document on its website Friday evening. Most of the 400-page audit remains undisclosed despite lawsuits by New Mexico In Depth, the Las Cruces Sun-News and the Foundation for Open Government demanding public release of the audit. Attorney General Gary King and his spokesperson, Phil Sisneros, did not return multiple phone calls Friday night. King stated in a Friday court filing that releasing the rest of the audit could jeopardize his office’s investigation, The Santa Fe New Mexican reported. “Those findings identify witnesses, specific compliance issues, and the specific methodology by which the audit investigated potential issues, including possible Medicaid fraud,” The New Mexican quoted King’s filing as saying. Despite receiving the newly released portion of the audit, one officer of the Foundation for Open Government lamented Friday at how few revelations were contained in the document. Significant parts of the newly released audit pages were blacked out, making them unreadable. The portions of the document that were readable seemed to raise as many questions as they answered. In recommending a list of “best practices” for Medicaid payment rules and regulations, the firm doing the audit, Massachusetts-based Public Consulting Group Inc. (PCG), noted New Mexico already used some of the rules and regulations, but didn’t always enforce them. Medicaid is the government’s health insurance program for the low-income. The document didn’t go into great detail about what rules and regulations the state was not enforcing prior to the audit. The document also contained a tantalizing paragraph about “credible allegations of fraud.” That is the standard the New Mexico Human Services Department (HSD) used to suspend Medicaid payments to the 15 providers, and to refer those providers to the AGO for potential prosecution. Centennial Care refers to the state’s Medicaid program under Gov. Susana Martinez. In conducting its audits of the 15 providers, PCG scrutinized clinical case files for randomly selected patients or clients, but it also scrutinized each provider’s computer and technical systems and procedures used to bill for payment for services. “Credible allegation of fraud” is a new threshold the 2010 federal health care law created. It gives states more authority to pursue Medicaid fraud by lowering the threshold from the more stringent standard “reliable evidence of fraud” that existed previously. Perhaps most importantly, the document released Friday left unsaid how a determination of “credible allegation of fraud” is made. It also appeared to provide contradictory information about who has the authority to make a determination that “credible allegation of fraud” exists. In the previously released executive summary of the audit, PCG stated that it could not determine “credible allegation of fraud” against a provider based on the audit’s findings. Only the state had the authority to make that determination, the summary said. The Human Services Department announced in June that the audit uncovered potential fraud – an announcement it used to justify freezing Medicaid payments to the health organizations, which sparked a chaotic transition to new providers from Arizona as many of the New Mexico providers went out of business. Since early August, HSD has refused to answer repeated questions from New Mexico In Depth about how “credible allegations of fraud” were found against the 15 providers. King, Sisneros and HSD spokesman Matt Kennicott did not return phone calls Friday evening from NMID, which was seeking clarification on the issue. It was also unclear Friday night why the attorney general released the document to the Foundation for Open Government but not NMID. In addition to the executive summary, the AG and HSD had previously released the audit’s background, understanding and methods sections that explain the audit. But even with the release of the new portion, hundreds of pages of the audit remain secret, including portions that lay out specific findings against each of the 15 providers. • PCG found “a few common themes across many of the 15 providers reviewed. … Non-compliance with many New Mexico state rules and regulations was common.” The portion of the audit released Friday names none of the specific rules and regulations providers allegedly violated. The state can withhold an audit of 15 health providers under investigation for potential Medicaid fraud because such secrecy is necessary to protect the criminal probe, the Attorney General’s Office says.